The lap desk and quill with which the Treaty of Guadalupe Hidalgo was written are set to appear at auction on September 7. Once belonging to American diplomat Nicholas Trist, the astonishing discovery was unearthed on a small farm in Nebraska, where it will be sold at a local auction house to the highest bidder. The Treaty of Guadalupe Hidalgo was the document which effectively ended the Mexican-American war in 1848. Largely dictated by the US, the treaty ensured Mexico's surrender - after the defeat of its army and the fall of its capital - and saw the two nations enter into negotiation. The treaty also led to the United States' purchase of 525,000 square miles from Mexico, including all or part of 10 states: Texas, Arizona, California, New Mexico, Colorado, Nevada, Utah, Oklahoma, Kansas and Wyoming, making it the second largest land purchase in the country's history. "Already we have been contacted by several museums from around the country, expressing strong interest," said the auction house's Kelly Aumann. "An opportunity like this is simply unheard of and a find like this is truly once in a lifetime. These items are of such monumental historical significance it's impossible to predict what they might bring at auction." Made circa 1837, the brass nameplate on the desk reads "N P Trist" and was produced by N Starkey of Philadelphia. 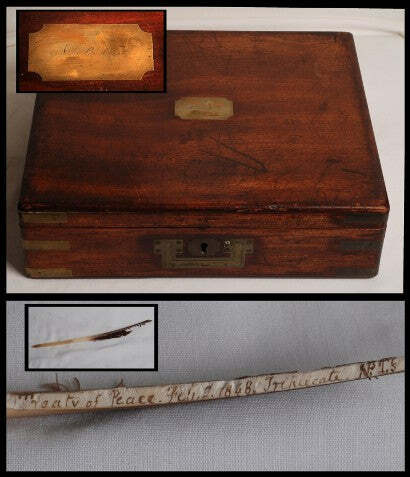 The quill has been filled with plaster and is inscribed with what the auction house believes to be: "Treaty of Peace, Feb. 2, 1848 Triplicate NTP's Signature", though further investigation is required to ascertain the exact wording. Paul Fraser Collectibles has a superb range of important historical documents in stock, including a rare 1848 copy of the Declaration of Independence, of which just 250 are known to exist.